I am proud to announce that I have teamed up with Minn Kota and Talon for the season. They join Quantum Rods and Reels, Hot Rod Baits, Vexilar, and Optimum Baits as my team of sponsors and affiliates (just click on their logo at the top of my website to view their great products). All these companies have two things in common, great products that help people catch more fish, and great customer service if you need it. I am proud to add Minn Kota and Talon for this year. With that addition, I had two Talons installed on my boat this past week. 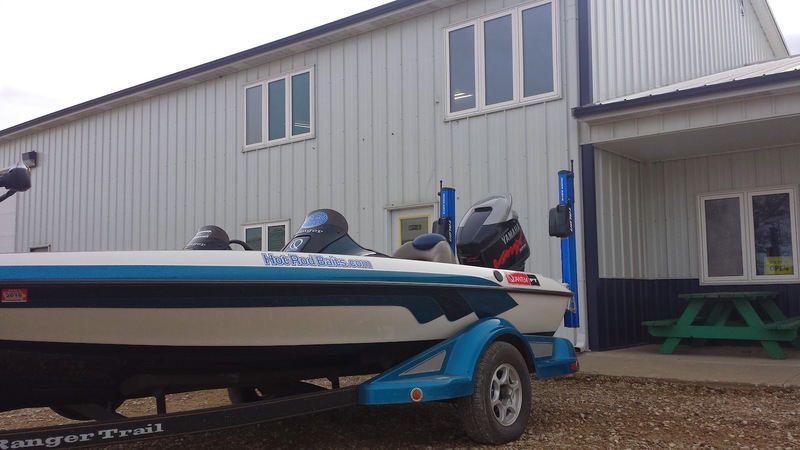 I have had Bottom End Boat Service near Garwin and Tama here in Central Iowa help me out with boat maintenance before. He has recently expanded his services into all Minn Kota products. Chris is great to deal with and always has time to talk with you to get your boat just the way you want it. This kind of service is not common anymore, which will bring me back to the Bottom End Boat Service center in the future. His attention to detail is second to none with any boat problem or outboard need. Add that fact with the a complete Minn Kota service center and sales of any Minn Kota product and you have a boaters dream world! If you have any boating/trailer/motor problems he is the one to get a hold of. Now that the Talons have been installed I can't wait to put them to the test this year. The shallow water anchoring system will lock your boat down in water as deep as 12 foot with just a push of a button on a wireless remote. This is a tool that will no doubt help anglers catch more fish and use their time on the water more effectively. Of course, many more reports on these as the years go on. Today I had the chance to join Zach Maxfield in his boat at Rock Creek Lake. We decided to give it a try to see if we could get a bite in this early part of the bass season. Rock Creek is known as a big bass lake and it proves it year after year...which was the main reason we chose the lake. We didn't expect much but the weather was just too nice not to try and the water temperature was around 45 degrees. After about an hour of throwing jigs, soft plastics, and jerkbait, Zach finally connected. He was throwing a jerkbait and when I saw the bend in his rod I knew he had a good one. It wasn't good, it was amazing. A huge bass made its way into the net and weighed in at 6.2 pounds, a monster bass anywhere! An hour or so later I connected on a texas-rigged Hot Rod Baits Big Craw. A plump 16+ incher became my first fish of the year. A few minutes later fish number two for me, a 14-incher on the same bait. 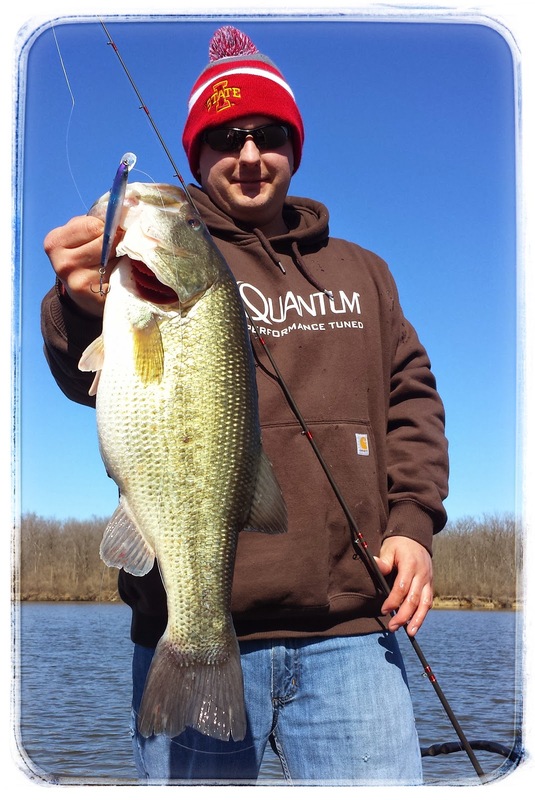 We left shortly after that, with Zach's boat working well, our Quantum rods and reels working flawlessly, Zach with his biggest bass of his life and a good start for me and the 2015 open water season. The last ice for the winter??? Tuesday evening, March 10th might have been the last time on the ice for me. The ice was still plenty thick at Otter Creek but the top was pretty soft. There were a dozen or so men on the ice trying to land that one last fish before giving up on the ice. The temperature was absolutely wonderful, only a sweatshirt was needed to enjoy the time on the ice. Enjoy I did! 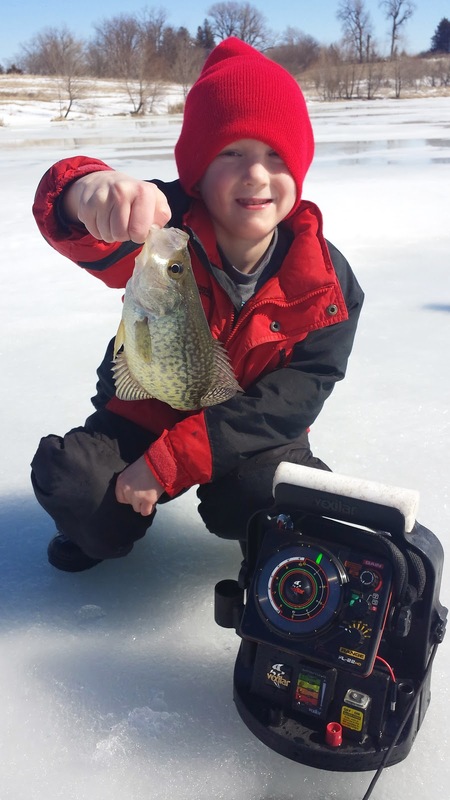 Numerous crappies, a few gills and many yellow bass came topside of the ice on this quick trip. Finding suspended and active fish with the Vexilar was key. Jigs and spoons were both used, but this particular night the jig out-fished the spoon. Most likely the last time, and a great time it was! This past weekend I was able to enjoy the beautiful weather with my son and daughter at a local farm pond. After a bit of looking around we finally found some eager crappies and the occasional bluegill to fill our morning. It really amazes me how kids can catch on to reading and using the Vexilar. They would get so excited when the "red" line was back on the screen, as they knew a bite might occur any moment after that. Pure joy is the only way to explain the short morning trip. March 1st marked the last event in this 4 tournament series. Team Extreme is an organization who brings top-notch ice tournaments to Iowa. They also have a Minnesota and Wisconsin division. The Team of the Year standings is the total number points collected by a team who fishes the events. 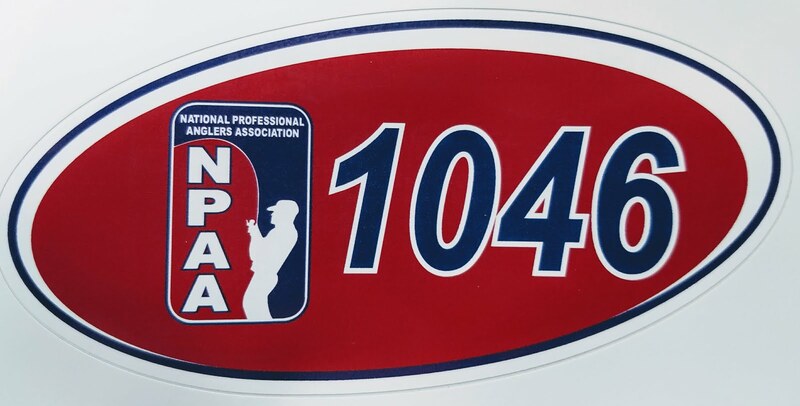 Mark Anderson and I made a commitment to fish all the events this year to see how we matched with other top ice anglers from all over the state. 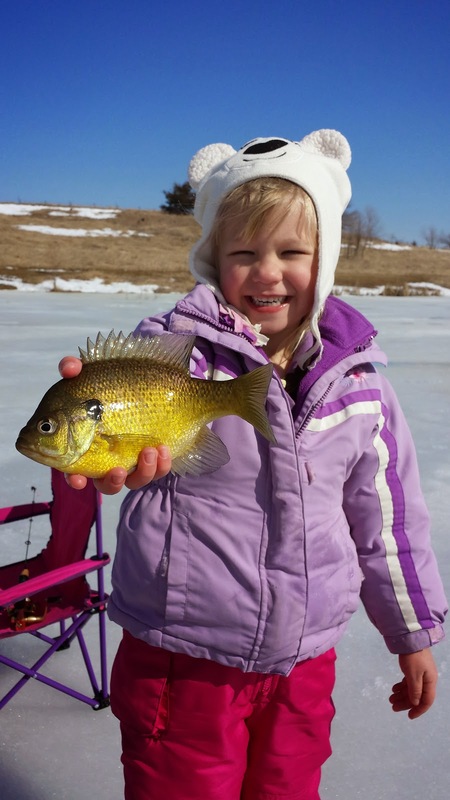 Stop #1- West Lake Okoboji: Bluegills were the target on this famous Iowa lake in the Emerson Bay area. Green weeds were the target and we found a couple good areas that bluegills were cruising through. Sight fishing in shallow water for big gills...it's a rush! We ended up in 5th place at this event with 22 teams fishing. Stop#2- Big Creek Lake- This is a lake that my partner Mark Anderson knows very well. He has spent countless hours on the lake drilling a thousand or more holes. The lake was "off" all winter long and this tournament was by far the toughest of the year. No team caught a limit of 8 crappies and 8 bluegills. We ended up in 2nd place out of 12 teams. This took us to the top of the Team of the Year leader board. Stop #3- Brushy Creek Lake- If you know anything about this lake it is all about the standing timber and the old creek channels. This was a lake that neither one of us had any experience on. During our practice time over the span of 3 weekends we were able to narrow down the lake to 3 different areas. Our crappies came early on our fist spot, and our bluegills came on our second spot. We never made it to our third area. We ended up in 2nd place out of 14 and once again extended our lead in the Team of the Year race. Stop #4- Rock Creek Lake- Much like Big Creek, this is a lake that I have drilled a thousand or more holes on over the past decade. We had a game-plan for the lake at several different areas and we executed it well. We just didn't' get a bigger bite with our crappies. A limit was easily caught but we ended up in 5th place out of 17 teams, which was plenty to achieve our goal that we set before the season began. Mark Anderson and I were crowned the Team Extreme Ice Fishing Iowa Team of the Year and we couldn't be happier. We didn't win a tournament, however we never finished below 5th place and accumulated 390 points out of a perfect 400. This couldn't have been possible without the seamless teamwork that Mark and I executed throughout the year. We have rarely fished together outside of tournaments, but have proven that we make a great team on the ice! This accomplishment won't be soon forgotten. It took a commitment to prepare and compete in four different tournaments. This is something that I enjoy and look forward to, but at the same time appreciate my family for putting up with my absence at home, and when my kids ask how the tournament went, or if I brought fish home or to see pictures of the fish it makes me feel a lot better. 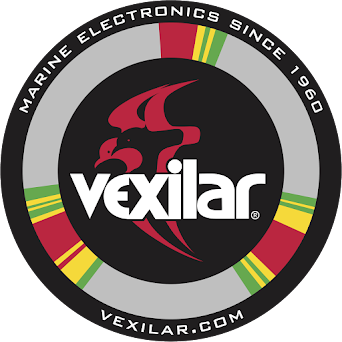 So, in conclusion I cannot thank my family enough, my partner Mark Anderson and Vexilar for all they have provided me through this ice fishing season. 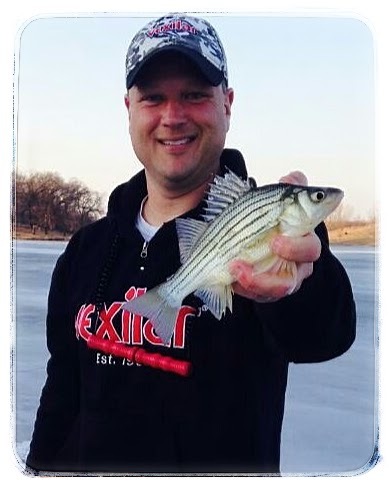 My ice fishing tournament season came to a close yesterday in the finale of the Team Extreme Iowa Division. The event was located at Rock Creek Lake, a lake that I have frequently visited in the past decade. Prior to this event my partner Mark Anderson and I were in first place for Team of the Year by 6 points. This meet that we the team behind us had to beat us by six places to take the lead, as each place in the tournament is worth one point. Needless to say we were glad that the last event was on a lake that we were both familiar with. As fate would hate it though, this particular year I had only visited the lake two times before the event, something I was not real happy about it, but is has been a busy winter. We went into the event fishing on a lot of past history and knowledge of the lake. We started the day fishing in the deeper basin in about 12 feet of water and the action was slow. 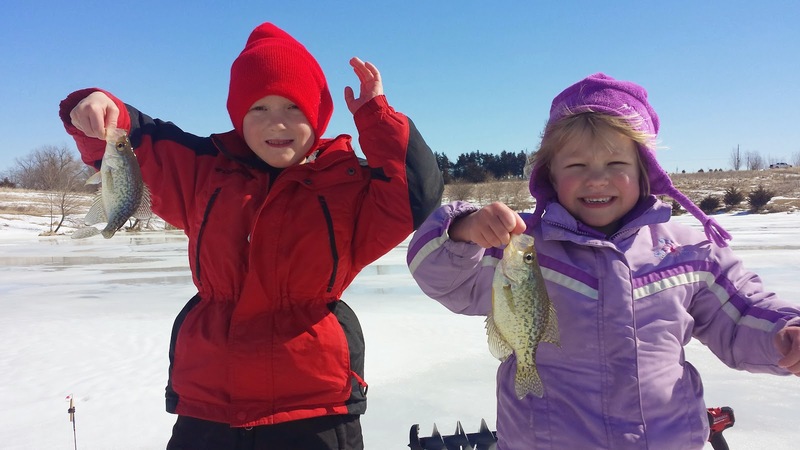 We picked up a few gills and crappies but weren't satisfied. We over on to another location in the basin a little deeper to search for those suspended crappies and bottom hugging gills. Using our Vexilar FLX-28s we quickly moved from hole to hole looking for active fish. If we saw signals on the bottom, a quick flip to zoom mode on Vexilar and we were dialed in to those bottom huggers. Using plastic baits all day long made for quick catches as schools of gills and crappies came through the basin. Some were hungry and some schools we really had to work for. We hit several others areas that day under 10 foot of water and caught fish there too. It seemed like fish were biting all over the lake, and we upgraded our catch until the last few minutes of the day. On the day we probably caught 60-70 crappies and gills and had out best 8 of each to weigh in. We ended up with 5.90 pounds which I thought would be pretty good. However, several other teams found some bigger crappies and we ended up in 5th place out of 17 teams. A respectable finish but lower than we had hoped. As we waited for all the teams to weigh in we could only wait to see if we had caught enough to capture the Team of the Year crown.